Read all there is to know about the new 2020 edition of the Tenerife Carnival! The 2018 Carnival in Santa Cruz de Tenerife has already been announced and here you can find the dates, program and all you need to know about it! The theme of the Tenerife Carnival in 2018 was up for public voting until 31 march 2017. The theme from which the public could choose were: Carnival on ice (El Carnaval sobre el hielo), Fantasy (La Fantasía), New York, the city that never sleeps (Nueva York, la ciudad que nunca duerme), The Old West (El Viejo Oeste), The Renaissance (El Renacimiento), Old Greece (La Antigua Grecia) and The Savanna (La Sabana). The chosen theme for the Carnival in Tenerife 2018 is La Fantasia - Fantasy. There were over 12000 votes in total on the online platform, and around 25% of the voters selected the theme Fantasy as their preferred option with over 3000 votes. So let your fantasy go wild and bring your craziest suit for this amazing event in Tenerife! 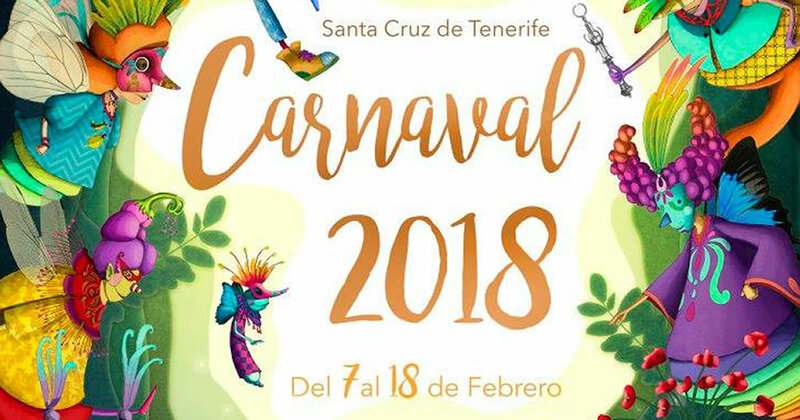 The City Council of Santa Cruz de Tenerife has opened now the online public voting for the carnival's poster and you can go here to choose the proposal that you like best. The voting for the poster has now ended. The public has chosen the winner poster for the 2018 carnival in Santa Cruz de Tenerife: it's the work of Nareme Melian Mahugo, who obtained a total of 10452 votes (almost 25% of the total submitted). His poster illustrates beautifully the theme for this year - La Fantasia and will be representing the events in the month to come. The Queen of the 2018 Carnival is Carmen Laura Lourido Perez - see more info and a photo of her amazing costume in our dedicated article. Méndez Núñez, Pilar, Villalba Hervás, La Marina and ending in the Avenida de Francisco La Roche. Location: Avenida de Francisco La Roche. This is one of the best parts of the carnival for many of the participants. The celebration starts with a giant sardine that is followed by a funeral parade of men in drag. At the end of the parade the sardine is put on fire, in a show that is both mesmerizing and bizarre, a unique experience for the participants. The Carnival in Tenerife is the second largest carnival after the one in Rio de Janeiro and it's certainly the biggest and most important event in the Canary Islands. From start to finish the carnival lasts more than a month and this year the festivities will start less than a week after the celebration of the Three Magic Kings. Most of the towns and resorts in Tenerife are also celebrating with their own carnival, but these events will be announced at a later time. Los Cristianos, Los Gigantes, Puerto de la Cruz, Adeje, all of them have their own carnival, smaller in size compared to the one in Santa Cruz, but less crowded and with plenty of charm. If you are coming to Tenerife for the carnival, it is better to get accommodation in the capital, even for a few days while the event is taking place. You can get a cheap apartment on Airbnb if you book with some time in advance, and that way you will avoid crowded buses and busy traffic. You can also get a discount for your first booking if you sign up using our Airbnb coupon code.